If you came to law school without taking economics (or if your memory is dim), you might be confused by references to the Coase Theorem, marginal utility, the Prisoner's Dilemma, and other economic concepts thrown around in law school classes and law review articles. 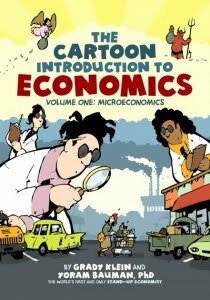 Good news: The Cartoon Introduction to Economics: Volume One: Microeconomics can give you a quick introduction (or review). The presentation is lighthearted, but the content is solid. The author is Yoram Bauman, who teaches in the UW's Program on the Environment. In addition to doing some very serious work on the economics of climate change, Dr. Bauman is also "the world's first and only stand-up economist." For the book he teamed up with cartoonist Grady Klein, who provided droll images to make the economic concepts understandable and memorable. You can view a sample of the book here or check out the book from the library: HB172 .K67 2010 v.1 at Good Reads. The Congressional Budge Office recently released a 31-page report called Federal Climate Change Programs: Funding History and Policy Issues. The study reviews regular appropriations and funding through the American Recovery and Reinvestment Act of 2009. Funds were used for the electrical infrastructure, energy efficiency, research and development, tax preferences, and technology demonstration projects. Scalia [insisted] that looking to the words of the law and nothing else is the best way to discern its meaning. That's because members of Congress actually vote for -- and can be held accountable for -- the actual text of the law, unlike committee reports and other documents drafted by "teenagers," to support their own views of the law, as Scalia put it with disdain. The legislators don't read those documents anyway, Scalia said. "Congress passes laws, not conference reports." By that standard, Breyer replied, the words of the statute don't mean much either, because members of Congress don't read every word of the statute. A onetime Senate staffer, Breyer was far more willing to put his trust in a legislator and his or her staff to know a law's purpose as well as its words. If you are interested in experiencing their differing views, here is a video of a similar debate held at the University of Arizona in October, 2009. The National Law Journal article also points to a blog that “offers a rough near-transcript of many of the exchanges between the justices. “ Josh Blackman’s Court-centered blog describes the latest version of the debate in “Recap: Original Intent and A Living Constitution, a Conversation Between Scalia and Breyer.” C-SPAN will also be broadcasting the discussion at some later date. With a team of experienced statisticians and data junkies, we’ve compiled, tagged and sorted data from a (still-expanding) collection of sources. Our data comes from the U.S. government, from anonymous and aggregated spending transactions from Citi, and from third party data providers. According to Bundle, Washington residents spent an average of $40,480 in 2009, placing it 10th among states which spent the most. Our neighbor to the east, Idaho, spent just $28,537, placing it 4th from the bottom of states spending the least. Oh, just in case you thought living here was much more expensive than Austin, the Report shows that Seattleites spent an average of $47,336 last year, while those living in Austin spent $67,076. A number of states are suing the federal government, arguing that the new health-care law is an unconstitutional exercise of federal power. 13 attorneys general sue over health care overhaul, Seattle Times, March 23, 2010. And Washington is among the plaintiff states. We downloaded the complaint from PACER and posted it here. Attorney General Rob McKenna's press release about joining the suit is here. Governor Chris Gregoire's statement, "completely disagree[ing]" with McKenna's action is here. McKenna's decision to join the Florida lawsuit on his own may be unusual, but it's almost certainly legal, said Hugh Spitzer, adjunct law professor at the University of Washington and co-author of a book on the state constitution. The state constitution says the attorney general "shall be the legal adviser of the state officers" and can perform other duties "as may be prescribed by law." State law says the attorney general can represent the state "in all cases in which the state is interested." "Basically, he does not have the inherent authority (in the constitution) to join a lawsuit like this, but there is a good argument that he has the authority under this statute," Spitzer said. A new book by two UW faculty members explores geographic restrictions that are placed on people in the city -- often homeless people and people of color. Katherine Beckett & Steve Herbert, Banished: The New Social Control in Urban America (2010). The book would be interesting and important for anyone concerned about the law and the urban poor, but it's especially interesting locally because the city the authors study is Seattle. They use a variety of sources: records from the police and the courts, archives from the city council, interviews with prosecutors, defenders, and judges, and -- most vividly -- interviews with people who are subject to the restrictions. SOAP and SODA aren't just items on a shopping list: they're tools for restricting where an individual may go in Seattle. Very often probation (or a deferred sentence) for a minor offense includes an order to Stay Out of Areas of Prostitution (SOAP) or to Stay Out of Drug Areas (SODA). Hundreds of people are also given trespass admonishments, with orders not to go to one or many parks or not to go to one or many businesses. Violating these orders subjects a person to arrest, trial, and jail. And yet obeying the orders often isolates the person from his or her community and makes it difficult to get social services, and so most people covered by the orders do not obey them. The scope of the system is large (and therefore costly). For example, criminal trespass charges led to over 10,000 jail days in 2005. And the city attorney estimated that jailing SODA violators cost the city about $1 million from March 2006 to December 2007. For more, see the publisher's page or check the book out: HN80.S54 B43 2010 at Good Reads. Selected digital audio recordings of court hearings (at the discretion of the presiding judge; $2.40 per audio file). No billing unless an account accrues charges of more than $10 per quarter (the former limit was $10 in a year). A pilot project for opinions from up to 12 courts to appear in the Government Printing Office's FDsys service. For more information, read the press release: Judiciary Approves PACER Innovations to Enhance Public Access. Happy Freedom of Information Day! Today is National Freedom of Information Day, annually celebrated on or near March 16, the birthday of James Madison, who is widely regarded as the Father of the Constitution and as the foremost advocate for openness in government. It's part of Sunshine Week, "a national initiative to open a dialogue about the importance of open government and freedom of information." A list of past winner's of the American Library Association's James Madison Award is here. American University Washington College of Law is holding its Third Annual Freedom of Information Day Celebration, with a keynote address by John D. Podesta. This full-day program is presented by the Collaboration on Government Secrecy project. On March 19, you are invited to attend the Sunshine Week webcast featuring Norm Eisen, Special Counsel to the President for Ethics and Government Reform, and Miriam Nisbet, the new Director of the Office of Government Information Services. The webcast will be held from 9-11am in Room 220 of the Odegaard Undergraduate Library. The Sunshine Week program is sponsored by OpenTheGovernment.org. Thanks to the Government Publications Library for sponsoring the local broadcast. Today, March 14 (3/14), marks the quirky celebration of everyone's favorite irrational number, pi. Celebrations online abound. See, for example, the Google homepage, the "official" pi day homepage, and photos on flickr tagged "314." Mathemeticians aren't the only ones that have spent quality time meditating on this popular, transcendental number. In his 1985 article, "The Legal Values of Pi, (available on Google Books)" David Singer relays the story of a bill introduced into the Indiana legislature in 1897 (HB 246, Feb 12, 1897). It attempted to legislatively decree official methods for calculating pi and collect royalties from anyone using those methods. Although the bill was recommended for passage by the Committee on Temperance, the Indiana Senate voted it down when it circled through. I came across C. Steven Bradford, The Gettysburg Address as Written by Law Students Taking an Exam, 86 Nw. U. L. Rev. 1094 (1992), this afternoon. It's timely, since UW students begin exams tomorrow morning. I'm sure you don't make the classic exam mistakes that Prof. Bradford lists, but you might be amused by his parody as a little study break. You can read the article on HeinOnline, LexisNexis, or Westlaw. Id. at 1101-02 (most footnotes omitted). Judge A. Howard Matz (C.D. Cal.) has issued orders marked: "This order is not intended for publication or for inclusion in the databases of Westlaw or Lexis." That is, "really, really unpublished." A Judge’s Unusual Request: Don’t Print This in Westlaw or Lexis - News - ABA Journal, March 11, 2010. Stephen Montes, Matz’s courtroom deputy clerk, says the language is intended as a signal—and is not a command to Westlaw or Lexis. “On the occasions when the judge has added that language, it was designed to signal to the reader that he knew that the analysis in the order was not necessarily definitive or exhaustive--that the order should not be viewed as something he intended to contribute to developing jurisprudence,” Montes writes in an e-mail to the ABA Journal. Critics decry the creation of "secret" law and say it's useful for attorneys to learn how a judge has ruled even if the past decision lacks precedential value. And they also note that opinions can show up in many other online services besides the big two. The Electronic Frontier Foundation received a copy of Apple's heretofore secret licensing agreement for iPhone developers and posted it online yesterday. (Link to the March 8, 2010 article and pdf of the license) Perhaps unsurprisingly, the "agreement is a very one-sided contract, favoring Apple at every turn," according to EFF senior staff attorney Fred von Lohmann. Because the license itself restricts the developer from talking about the license in public, one could surmise that Apple understands the heavy-handed approach the license takes. Douglas Philips, in his book "The software license unveiled : how legislation by license controls software access," makes the observation that software licenses are increasingly using contract law to recast (and, in the extreme, subvert) public laws. One-sided contracts like Apple's provide examples where such an expansive view of contract law becomes problematic. Philip's book and many others about software licensing are available at Gallagher. The Washington Department of Health has released its 2009 Death with Dignity Act Report. The 10-page document "focuses on the 63 participants for whom medication was dispensed between March 5, 2009, when the act became law, and December 31, 2009. It includes data from the documentation received by the Department of Health as of February 3, 2010." It includes statistics and demographic information. The Food and Agriculture Organization's Gender and Land Rights Database "contains Country level information on social, economic, political and cultural issues related to the gender inequalities embedded in those rights." The site also includes information on relevant international treaties and conventions, customary law, land tenure, civil society organizations, and selected statistics. Three types of reports are available: individual country reports on 24 topics (includes 90 countries, cross-country reports on a single topic, and reports comparing two or more countries. In 1987, the U.S. Congress asked President Reagan to proclaim March Women’s History Month, which he then did on March 16, 1987 in Proclamation 5619. For more information about Women’s History Month, visit the Law Library of Congress and the National Women’s History Project. For more information here in Washington, see the Washington Women’s History Consortium. Also see our new Library display honoring some of our UW Law alumnae. Legal writing is filled with legal abbreviations, and it’s often necessary to use special resources to decipher them. While The Bluebook and Black’s Law Dictionary include many abbreviations, a researcher may need yet another resource often referred to as Bieber’s. The Library owns the updated version of this dictionary, Prince's Bieber Dictionary of Legal Abbreviations: a reference guide for attorneys, legal secretaries, paralegals, and law students (location: Ref. Area and Ref. Office, KF246 .B46 2009). The previous edition, the fifth edition, is available on Lexis. To locate Bieber’s on Lexis, go to the Search by source tab, then under the Option 2 - Look for a Source tab, click on the Find a Source tab and type in the word Bieber. While the older version available on Lexis may be useful to you, the print version available in the Library contains over 1,500 new or expanded entries.